I admit it. I love clothes. I like searching for unique pieces. My closet is full. Unfortunately, the clothing industry is toxic and socially irresponsible in general. Toxic dyes and factory conditions overseas enables prices to be lower, but at what cost to humanity and the environment? Three years ago, Greenpeace issued a report on toxic fashion. They tested in 141 items made in 29 different countries. Phthalates, amines, and nonylphenol ethoxylates (NPEs) were found. of those tested), showing little difference from the results of the previous investigation into the presence of these substances in sports clothing that was conducted in 2011.4 In addition, the presence of many other different types of potentially hazardous industrial chemicals was discovered across a number of the products tested. as inherently hazardous substances, any use of NPes, phthalates, or azo dyes that can release cancer- causing amines, is unacceptable. Around 80 billion garments are produced worldwide10, the equivalent of just over 11 garments a year for every person on the planet. The increased volumes of clothing being made, sold, and thrown away magnifies the human and environmental costs of our clothes at every stage of their life cycle. Even the apparently small, quantities of a hazardous chemical such as NPEs, which are legally allowed in clothing, cumulatively amount to the widespread dispersal of damaging chemicals across the planet. From manufacturing to consumer to landfill, the toxic chain of our clothing is ubiquitous. Now imagine the working conditions in these overseas factories where lax regulations cause socially irreprehensible conditions. Long working hours, under paid, toxin exposure are just few of the concerns. Coupled with the polluted local waterways, we must make better choices when it comes to clothing! Bangladesh’s garment workers earn the lowest wages in the world, an average of 24 cents an hour. Their work is also fraught with danger. On April 24, a building collapse near Dhaka killed more than 1,100 workers, and on May 8, eight people died in a sweater factory fire not far away. There is a choice. It may cost more a bit more to you, but the benefit to the planet and its citizens is invaluable. Just like the organic food movement has grown due to awareness and health consciousness, so has the sustainable fashion movement. Thankfully, much of my wardrobe is made by ethical companies from organically grown fibers. We were recently sent an Nadia infinity scarf by Callina Style. This company features natural fibers, like alpaca, and uses only non-toxic dyes or none at all. Handmade by artisans, these pieces are works of art. The scarf we were sent is made of baby alpaca fibers. It is soft and beautiful. 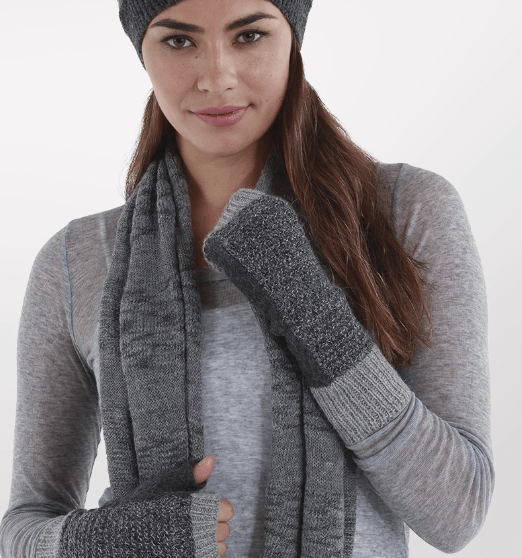 Although the website says the scarf is made of 100% baby alpaca fibers, the tag on the scarf says there is also some wool, acrylic, and polyamide, so it is not all natural. Polyamide can occur naturally, but acrylic cannot 🙁 Had I purchased this scarf online, I would have been disappointed to find it was not 100% alpaca. That being said, I love the scarf (and it is 50% off right now!). I’ve recently discovered I like to wear infinity scarves. In the past, I felt they limited my scarf options, but now I wrap them around my neck three times and feel super warm. Alpaca against my neck is lovely! Callina is also socially-responsible in their home of manufacture Peru. The Callina Collection includes yarn made from the alpaca, which for generations have been tended by communities in the Peruvian highlands. Peru’s rich textile heritage and culture of artistry has preserved this singular source of traditional alpaca yarn. The highland communities wide-ranging alpaca herds require shepherds and their families to travel long distances; often at the expense of children attending a regular school. In 2006, the Mirasol Project created a boarding school in the remote region of Puno, where the children of alpaca shepherds could stay Monday through Friday and attend school regularly; returning home on the weekends. Callina’s motto is “hand crafted fashion with integrity”. I love this! Sustainably-made while supporting artisans and their children is what every clothing company should espouse. Thank you Callina! Great post! You often don’t think of clothing in terms of impact on your health or the earth – but here you are! Thanks for sharing! Just FYI, the stainless steel dishes are made in China. Thinkbaby is another brand but the origin is Korea.